System software describes all files and programs that are not indispensable to the operating system functions but extend or guarantee the basic functionality of it to the user. When you install the operating system, the system software is also installed. Some system software may be necessary to ensure that the computer can perform basic functions in order to run other programs, that rely on it. It also can allows the operating system to communicate with the hardware of the computer in a modular way, that can easily be updated and configured to the existing needs. However, the end user does not run most of the system software, it runs in the background. The main functions of an operating system are: interfacing with users(translating user instructions), booting the computer, (loading the kernel into the memory, determine and configure the hardware attached to the computer), configuring devices (using device drivers to communicate to computer peripherals), managing and monitoring resources and jobs, file management(organizing and keeping track of files), security (using passwords, firewalls to prevent intrusion). System software should not take up a great deal of the computer's memory in order to run efficiently and should be transparent to the user so that the user need not be aware of what the system software is performing in the background. Another type of System software is represented by Utility programs having the role of managing and maintaining the computer system. They fall into several categories: file management programs (performing file management- file look up, copy, move, rename, delete), search tools (searching files), diagnostic and disk management programs (evaluate, diagnose and repair problems), Uninstall and cleanup utilities (deleting programs and temporary files), File compression programs, back-up and recovery programs, security programs (antivirus, antispyware, firewall). Tools to help with the development of software used with computers have been available for a long time but tools for developing programs for devices that use embedded software which are called device software development tools, have not been available until recently. One example of this type of tool is Wind River Workbench, which is a collection of tools designed to speed up the development of devices that use this programs operating system or version of Linux. Device drivers, commonly just called drivers, are software programs that allow input and output devices to communicate with the rest of the computer system. Many device drivers come with system software when you buy a computer. Most new operating systems recognize new hardware devices on their own and automatically install them, but sometimes they require a device driver cd for installation. Device drivers should be updated periodically. This can be done through the suppliers website. Device drivers are very common for printers, scanners, video adapters and sound cards. A Zip drive is a useful asset to your computer as it allows you to back up your work. It is a little bit larger than the regular A: drive floppy disks and have the ability to hold 100 MB, 250 MB, and now up to 750 MB of data. They allow you to back up hard disks, information on your computer, and also enable you to transport large files from computer to computer. They range in reliability and speed in writing the disk and most Zip drives are compatible in drives with the same capacity ability. Most Zip drives are relatively durable and even come with write protection. Also, some Zip drives can be accessed only with a password so your information cannot be tampered with. Uninstall Utility -Removing programs that you are not using enables you to free up space on the hard drive. Simply deleting the program’s folder from your hard drive does not ensure that the program will be completely uninstalled since certain parts of the program may still be sitting elsewhere (such as shortcuts on the desktop) and can ultimately slow down your computer. Removing the programs using an uninstall utility ensures a complete deletion of the program. The uninstall utility may be accessed through the operating system or on the program that is being deleted. Cleanup Utility -Another way to free up precious space on the disk is by using the Cleanup Utility. The Cleanup Utility deletes temporary files, such as files stored during a program installation, files sent to the Recycle Bin and temporary internet files. The registry cleaner deletes unnecessary information in the Windows registry, keeping the computer running efficiently. Disk defragmenter -This program optimizes the hard drive by searching for files stored on the hard drive in fragments and assemble them to be stored in contiguous locations. This will make the hard drive run more efficiently since files are more organized and can be more efficiently located. System Restore -System Restore is a very useful tool that allows a user to reset the current computer's system files to what they were at a specific point in the past. This tool is useful because if you ever install a program or a new driver that has an undesired effect on your computer and uninstalling it doesn't fix the problem, then you can simply use the System Restore tool to restore your computer's system files to an earlier date when your computer was functioning properly. 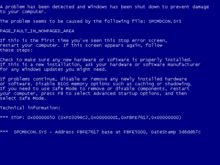 A blue error screen indicates a problem in the computer's system files which can sometimes be solved by using System Restore. Provides basic tools for troubleshooting network communication problems. There are ways to counterattack against these malicious software - if one is well-equipped. Antivirus_Software, anti-spyware, firewalls, and other security programs are available to protect against these attacks. Computer viruses are self replicating malicious software programs that can cause damage or perform other harmful acts to a computer system. Other than the virus, there are other security concerns in existence, such various types of spyware software similar to virus but not self replicating or worms that have as the only function to open breaches so that the infected machine is accessible from the network. Though they are intentionally designed not to be destructive and evident in the infected computer system (or a network of computer systems) they can disrupt functions. The objective of the virus and spyware is to profit from the information and resources it takes control. The term Spyware is used for software programs that secretly collect data and/or information, spying on the user's activities, without consent and then send it to an outside party, normally via the user's Internet connection. It can be as innocent as monitoring your web page visits so as to tailor the ads you are bombarded with, to logging keystrokes and all that may entail. The most serious implications of this practice are identity theft, and stealing sensitive information like credit card numbers etc. Generally, they are installed without knowledge of the user when running other types of software, the most common way is to receive an infected e-mail message with an infected attachment or link to a site that promotes the execution of some other piece of software. A lot of spyware gets onto computers through P2P services, such as this one. Lately, spyware use is happening more and more frequently and aggressively and it can damage your computer, causing it to work improperly or to slow down. Stealthware is a type of spyware that can deliver ads to your computer at any time, regardless of the activities it is engaged in. Browser hijacking is the act of spyware changing your browser homepage or other settings. The worst type of spyware rewrites your computer's main instructions to change your browser settings back to their hijacked form every time your computer is rebooted, undoing any changes you may have made to your browser settings. It is important to use Antivirus software  in preventing these unwanted programs from corrupting your information. Some of these viruses can corrupt your information, and some may overload your memories. In a lot of cases, virus can render your computer inoperable. It is also important to keep your antivirus software up to date as new viruses are created frequently. There are many Anitvirus software programs available on-line such as Windows Live OneCare which helps protect your computer from many different kinds of threats. This software in particular also helps you back up your important documents in case of emergency and runs regular tune-ups to help your computer run smoothly. Norton AntiVirus started in 1990. It is the most popular anti-virus program having over 100 million people worldwide using it.It has many valuable features. These features include detecting, blocking, and removing viruses, worms, and spyware.It also protects email and instant messages. For the computer's safety it will automatically renew your subscription. The current version is Norton AntiVirus 2007. Comodo Internet Security ensures 100% protection to the system for its users. This works as a package, which is in a combination of antivirus software along with an enterprise class firewall and an advanced host intrusion prevention system. All this can be used together or used separately for a specific purpose. To avoid and to prevent the attack of viruses Comodo offers Antivirus Software for Windows at its best. McAfee is also one of the worlds leading anti-virus programs. Similar to Norton, McAfee had been industry tested and reports 100% detection. It also has easy scheduling to keep the software and your computer up to date. McAfee software also scans e-mails and IM attachments as well as has a very idepth virus database. After surfing the McAfee site I really enjoyed how they have a section that explains what each of the viruses are and what the do in a language that the common user can understand. By being able to relate this to the user it allows the user to educate themselves and take action. On the down side, McAfee's e-mail monitoring creates a popup for every single e-mail outside of the preset limits. For someone such as myself that receives a lot of mail from unknown senders (some junk and some relevant) this can be a very time consuming chore. On the plus side, McAfee's price is a little less expensive so if your do not use your computer very much this is the program for you. Virex is McAfees Macintosh Anti-virus software. This is very similar to the McAfee anit-virus for the PC with several key differences. Because of the Mac OS X platform you are able to drag and drop the files that you would like scanned which can really speed up your monitoring. The Virex interface is different from that of the PC interface it has been designed with the Mac user in mind. With operating Virex you will find that the program is the same user friendly Mac screen. As well with drop scan this makes it easy to run extensive searches through individual pieces or individual files. This can prove to be quite useful when running multimedia editing software where only portions need to be scanned. There are many free antivirus programs and windows utilities that are available for use on desktop and laptops I would like to introduce three in particular that are very useful. The first program you can use is from Piriform.com which is named C cleaner. This software supports Windows 7, Vista and XP also (there is also a version which supports Mac OS X 10.5 or 10.6). This will clean Internet Explorer, Google Chrome, Opera, Safari, and Windows Registry cleaner. C cleaner will clean temp files, history, cookies, and the auto complete form history. On Windows it cleans recycle bin, recent documents, and temporary files and again form history. On the Registry it cleans the unused and old registry history. The next is Auslogic disks defrag can be found on the site auslogic.com. The disks defrag “process reduces the amount of fragmentation's” it will organize storage devices into smaller fragments so to create more space. The last software to introduce is Microsoft Security Essentials.. This can be found at the Microsoft.com site. Before you use this software the computer must have be installed with genuine Windows. This software will scan and do updates on scheduled times. I believe that antivirus software can be useful in keeping your computer running more effectively and free from viruses. Zone Labs is a brand of software which provides Internet security solutions. It protects PCs from spyware, personal data theft, identification information theft, and of course hackers. This software is derived from its own research center, which presents us with up-to-date security, anti-spyware and anti-virus information. It also alerts us of the most recent security threats. This software allows your computer to still run quickly and smoothly, due to its superior compatibility. Parents are advised to use this program, as it prevents children from access to inappropriate websites. While emailing, it is able to quarantine unknown attachments while stopping the spread of it by preventing outbound messages so you don’t send it out to everyone in your address book. It blocks out those annoying pop-up advertisements so you can surf the web without having to keep closing the boxes. Also, when you install new programs it will alert you of any dangers there may be. Detect and automatically removes viruses, Trojan horses, and worms. Checks incoming and outgoing email attachments for viruses. Automatically scans incoming instant message attachments for threats. Checks compressed file archives for viruses. Keeps dangerous Internet worms out, blocking them before they infect your system. Automatically downloads updates to protect against new threats. Automatically scans for viruses upon completing a download. Using smart technology to detect emergent worms and other new threats without waiting for updates. When it comes to anti-virus software Norton is the industry leader. Norton has been given praise for reports of to having 100 percent detection for virus. Norton easy scheduling scans which make it easy to keep your computer up to date. Norton does everything from scanning inbound and outbound e-mail to IM attachments. Essentially it monitors all information going into and out of your computer. One feature that makes Norton stand out is that in includes an inbound firewall protection. However, all these great features do come at a cost Norton is on the high side of the market and there are many other alternatives for a lower price. Norton includes spyware, firewall, security, systemrestore and ghost. All in all if you are looking for a sure bet with minimual hassel Norton is it. ↑ "Antivirus software". comodo.com. https://antivirus.comodo.com. Retrieved 2016-04-25. This page was last edited on 7 January 2018, at 15:09.